Pictured, left to right, are Image360 owners Ronni and Bryan Kinglsey, along with their designer, Dominic Sanzone. As more businesses continue to choose Delaware County to begin or further grow their company, the need for branding and marketing tools, too, is rising. Ronni and Bryan Kingsley of Image360 in Lewis Center believe they can assist. Located at 8917 S. Old State Road, the Lewis Center store is one of more than 120 Image360 locations around the country and the second in central Ohio. With Polaris and several booming communities surrounding the location, the owners believe they are in a prime spot to grow along with their customer base. The company offers a multitude of products and services ranging anywhere from banners to vehicle graphics, and plenty more. For new businesses, they will even help in creating a unique logo. Whether it’s a school or a startup, yard signs or interior displays, Image360 can cater to just about any need. That they cross over into advertising and branding is not typical for most sign shops, Ronni Kingsley said. But more so than simply what they offer, the Kingsley’s believe it’s how they go about offering it that will build their own brand within Lewis Center and the surrounding communities. 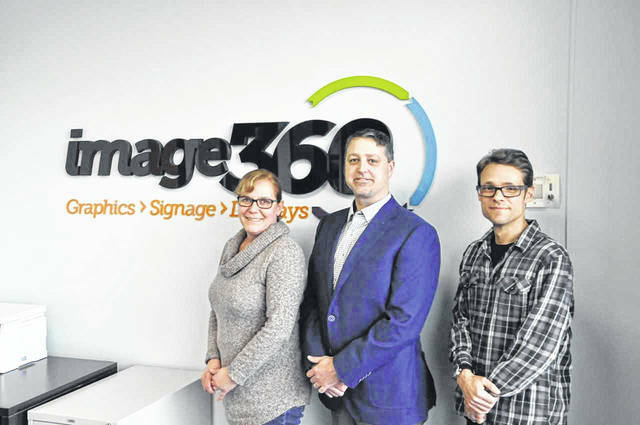 Bryan Kingsley, who worked in IT previously, and Ronni, who was in the human resources industry prior, didn’t have a background in the sign industry. But after hearing the depth of Image360’s offerings, the married couple better understood the full scope of the service. “There’s so much that is involved with this, so many different channels of creativity that you get to see a lot of different visions become real,” Bryan Kingsley said. Creating tangible products and being able to point out their creations around the community is one of the more rewarding aspects of their work, Bryan Kingsley said, and something that wasn’t the case in their previous lines of work. As they continue to grow their client base, Bryan Kingsley said the next progression will include adding more equipment to expand their abilities, which will, in turn, require either a larger building or adding a second building for production. Ronni Kingsley added she hopes to start landing national accounts as well in the future. To learn more about products and services offered at Image360, visit www.image360lewiscenter.com or call 614-438-7446.
https://www.delgazette.com/wp-content/uploads/sites/40/2019/02/web1_image360.jpgPictured, left to right, are Image360 owners Ronni and Bryan Kinglsey, along with their designer, Dominic Sanzone.